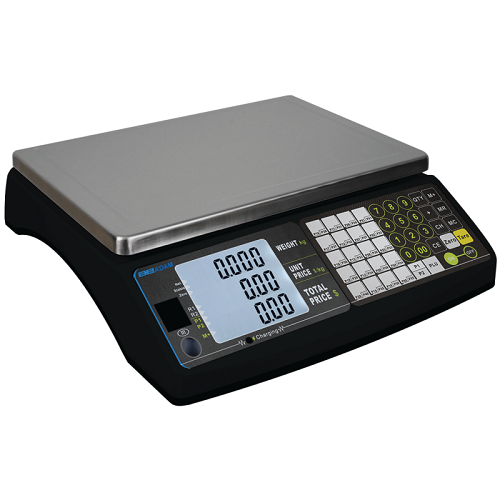 The Raven Price Computing Scale created by Adam Equipment Inc. is a dual-range scale that is perfect for retailers who regularly price compute items for customers. The lightweight design makes it easy to store the scale and take it with you on the go. It can be powered by either an AC adapter that plugs into the wall or a rechargeable, internal battery. The battery can be run for several days on a single charge and makes it easy for produce vendors to sell at various farmers markets. The backlit LCD displays the weight and unit price simultaneously for the customer and cashier and comes with color coded keys that are easy to find. The tare feature allows the user to place a container on the scale, set the scale to zero, and then place items in the container. The scale will only measure the items placed on the scale after it has been set to zero. The Raven also has overload protection to help protect internal components. The grade 304 steel pan can be removed and cleaned quickly between measurements and the non-slip feet can be adjusted and locked. This portable computing scale will be perfect for small businesses that need to weigh products on a regular basis.